Occasionally, when I am training friends, clients or co-workers how to shoot, I will attach a laser to their gun to help them better understand some basic shooting concepts. 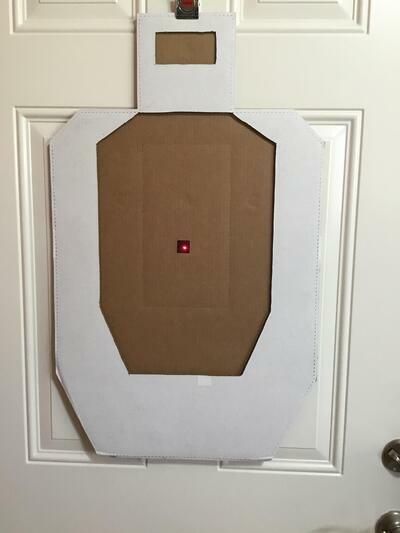 I make a dry practice target out of 2 USPSA targets. 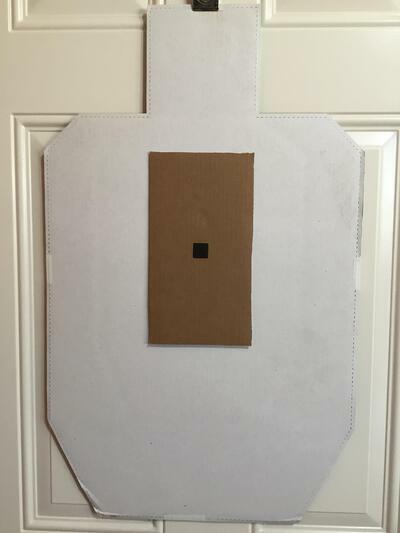 I use USPSA targets because they are different colors on each side. USPSA targets have an upper head with an A and B-zone and a body with A, C and D-Zones. You will need a razor or a pair of scissors. You will only cut one of the targets, the other will remain wholly intact. For simplification, we will refer to the target that we are cutting as target 1 and the target which will remain intact as target 2. Cut the C-zone out of the target. The body A-zone is included in this cut. Be careful to leave the head attached (don't cut off the head); You need to razor / cut under the perforations while trimming near the head. 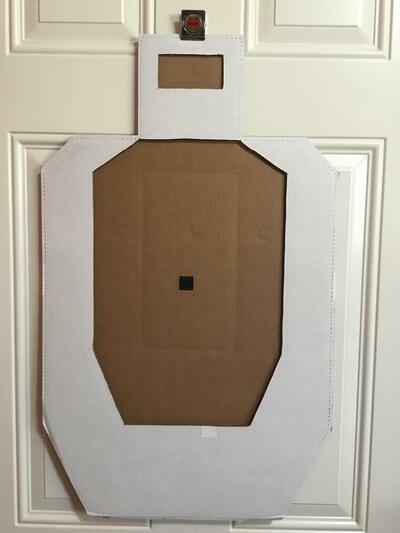 This should make a white colored target in the D and B-zones, with the tan colored target in the C and head A-zones. Use small pieces of white tape to tape the top, bottom and sides of the two targets together. Flip the targets over so Target 2 (white side) is facing up. Place the tan colored side of the body A-zone (that you cut from Target 1, step 4) on top of Target 2 A-zone. If you have trouble lining up the A-zones, you can push a small push pin through the diagonal corners of the A-zone on Target 2. Use the push pin holes to align the corners of the body A-zone. To finish the dry practice target off, I add a one-inch black square piece of tape to the center of the corresponding scoring zone. I like to measure the center of the C-zone's height, as the perforated "A" is NOT the center of the A-zone. Now you should have one practice target that has 5 distinctly noticeable scoring zones; A-zone body, A-zone head, entire head, C-zone body, and the entire target. Additionally, you have a one inch black piece of tape on each side of the target. Before you begin your laser dry practice, attach and zero the laser at the distance you plan to practice. This is critical for some of the drills we are going do with the laser. Get your Laser Target 1 - with the C-zone side visible. With the laser turned off, use the iron sights to aim in the center of the C-zone. Make note of how stable the gun is while you are aiming in the middle. We are not pressing the trigger yet, only aiming the gun. Now turn on the laser. Shift your focus to the laser's dot on the target. Make note of how stable the dot is on the target while you are aiming. It's probably moving around more than you would think or like. Try to keep the dot inside the C-zone - hopefully this is fairly easy. It should be readily apparent when the dot leaves the C-zone and enters the white background of the D-zone on the dry practice target. First steady the dot in the body's A-zone. Once you have mastered the entire head, move to the head's A-zone (on Laser Target 1). Finally, test your hold on the 1” black square of tape. Quite simply, if you can’t even “hold” or keep the gun aimed in a particular target zone, it is unlikely that your bullet will impact the desired scoring zone reliably.